Its been a while since I have been on this forum, having trouble adding images into my posts. I have a build thread going but I had some trouble today trying to add images. There are images on there from before but I can't remember how I put them there. 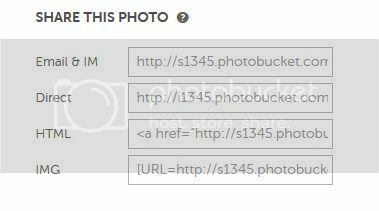 I copied and pasted the image URL from Photobucket but its not showing anything, the image sizes are small, so I have no idea what I am doing wrong! If they are uploaded on Photobucket, click on the photo you wish to add into your post. Click in the box next to "Direct". It should automatically copy the link, if not you can highlight it and copy it. Anywhere you want a picture, click on the little image next to the smiley face. Then paste in the link you copied and it should drop the picture into your post! Thanks for that, now I know where I went wrong... I copied the images in the wrong manner.